Burrendong investigation to impact river heights. 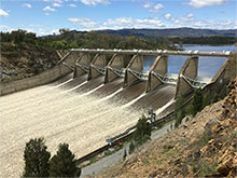 Work at Burrendong Dam associated with the cold water pollution curtain will require interruptions to dam releases that will result in fluctuating river heights immediately downstream of the dam for at least a week from Monday (28 August). Currently approximately 3000 megalitres (ML) is being released daily to provide for communities downstream and the environment. The work will require that releases cease for up to three hours, twice a day. When releases resume they will be in excess of current 3000ML/day to ensure that sufficient flow occurs along the river. The impact on river heights will be most obvious to landholders in the immediate vicinity of the dam, and these landholders should be vigilant and take steps to safeguard infrastructure and livestock. Water System Operations Manager Central, Sri Sritharan, said landholders and river users further downstream would perceive little change. “During the coming week it is advised that landholders immediately downstream of Burrendong Dam be aware of the fluctuating river flows and take steps to protect pumps and secure livestock,” Mr Sritharan said. A notification has been distributed to WaterNSW customers on the upper Macquarie, and an automated early warning notification sent to registered users. Burrendong Dam, one of the largest inland dams in NSW, currently is at 83% of its total storage capacity.